Houseless, not homeless! : Hunger and homelessness rise in U.S. cities: report - "The Houseless"
Hunger and homelessness rise in U.S. cities: report - "The Houseless"
Come tourist to the good ole' United States of America and see it in its transformation stages - Change - of being ripped apart. We do not seem to want to learn from mistakes, nor history. Boy, oh boy, the U.S.A. used to be a really fine place to call home and I want it back. (Reuters) - Across the United States, the number of hungry and homeless people is growing, and budget fights at the federal level are threatening the aid many need to survive, the U.S. Conference of Mayors said on Thursday. Amidst the holiday season of family feasts and corporate dinners, the mayors released a report that found requests for emergency food assistance rose in 21 out of the 25 cities it surveyed in 2012 and remained at the same level in three. More than half the cities said homelessness increased. "This report is a stark reminder of the long-lasting impact the recession has had on many of our citizens," Greg Fischer, mayor of Louisville, Kentucky, said in a statement. "Families, who once lived in middle class homes, now find themselves without a roof over their heads, needing multiple social services for the first time in their lives." The 25 cities are of varying size and wealth in all regions of the country. They included Boston, Chicago, Cleveland, Dallas, Los Angeles, Salt Lake City and Nashville, Tennessee. Among those seeking emergency food, 51 percent were in families and 37 percent were employed. Nearly 1 in 6 - 17 percent - were elderly and 8.5 percent were homeless, according to the survey. Nearly all of the cities reported a rise in the number of people seeking emergency food for the first time. "In Philadelphia, I see people who are hungry and in need of shelter on a daily basis and explaining to them that Congress is cutting funding for the help they need is not acceptable," said Philadelphia Mayor Michael Nutter in a statement. The impending "fiscal cliff" has people with lower and middle incomes worried government funds for safety net programs will drop just as emergency unemployment benefits end. President Barack Obama and Republican leaders in the U.S. Congress are negotiating on how to avert tax increases and spending cuts due to take effect at the beginning of 2013. Republicans in the House of Representatives are pressing to cut $16 billion from food stamps as they hammer out an overdue farm bill. The 2007-2009 recession pushed up poverty and unemployment, while enrollment for food stamps, which help cover grocery costs, soared. As economic recovery takes hold, the unemployment rate has fallen to 7.7 percent from a peak of 10 percent. Still, the country's poverty rate remains at 15 percent and a record 47.7 million people use food stamps. The hunger problem is likely to get worse next year. Three-fourths of the cities expect the need for food to rise. No city expects a decrease. Sixty percent of the cities surveyed expect an increase in the number of families without shelter and 56 percent anticipate a rise in homeless individuals. More than half the cities say there will not be enough shelters available. The survey confirms what many soup kitchens, pantries and other charities have been saying throughout 2012. "We are always at capacity. If you are in a flood and someone says more water is coming you might not be able to tell because you are already in a flood," said George Jones, chief executive officer of Bread for the City in Washington, this fall about a rise in the number of people seeking help. 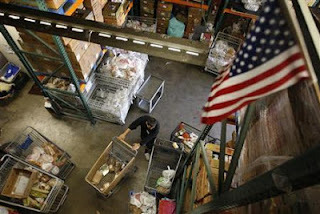 In the survey, Washington said the Capital Area Food Bank, an umbrella organization for assistance groups in Washington, is reaching two-thirds of those at risk of hunger. Officials at the food bank said calls to its hotline jumped 25 percent last year and it also opened a new warehouse in June to double its capacity and keep up with rising hunger. For the first time they are coordinating help at a military base, sending a truck to serve about 250 families at Fort Belvoir in Virginia. Michael Blue, a 62-year-old part-time bus driver in Washington, gets help from Bread for the City. He says work is so sporadic that he has to scrounge for cash to pay rent and utilities. But his $13,300 annual income tops the government's poverty threshold, disqualifying him from some welfare programs. He receives about $200 a month in food stamps. "They tell me that I don't qualify for help, but anybody who makes $13,000 or even $20,000 a year these days cannot survive," Blue said. Between jobs he jots down telephone numbers from tour buses headed to Washington's monuments, then calls to see if they need drivers. He cannot recall the last time he had a full-time job. "I am just being priced out of existence," he said.